A 630am pick up from the hotel by Vishan Sharma our driver for the day, air conditioned clean vehicle. Met our knowledgable tour guide Sunbasch for Taj and Agra fort experience which were spectacular. Weather was cool and not too crowded! Lunch at “The Chamber “ family restaurant delicious and plenty of it! Vishan safely delivered us back to Dehli in what can be chaotic traffic around 8pm, a long but worthwhile day. Overall the tour is well arranged and everything is on time. Driver pick and drop us to the hotel on time with safe drive. Our Tour Guide Mr.Saurav very professional and speak very well in english, he is patient to explain the history/background of Taj Mahal and Agra Fort He helps us to take many photos. Highly recommend to friends who wish to visit India. I am not used to make any reviews but this experience merits all my efforts to tell you all about it. First, immediately, after receiving my ticket, I received a whataspp message to welcome me and provide me with all the information which made me feel very safe with the trip from Delhi to Agra. This included the name and mobile number of the drive, the vehicle information, the time of pick up from my hotel, the guide at Agra. The car was super clean and the driver Mr. D.K Sharma was very nice, friendly and professional. The car was equipped with wifi and charging mechanism. cold water and one stop for tea and rest room. We arrived at 10:35 and at 10:31, the guide called to find out where we were. This was a sign of punctuality and professionalism! The guide, Mr. Mahesh Kumar, very knowledgeable, professional, and friendly. We were extremely lucky to have him showing us around. The knowledge he had was outstanding compared to the one I had 4 years ago. No comparison at all. He was very flexible and would ask us our opinion, if we were tired, if we want to see more/less. he was just great! He took amazing pictures. Please do not be fooled with the professional who will try to sell you album pictures. Your mobile phone will do the work and if you are lucky and have Mahesh as guide then you will get outstanding pictures. Lunch was just ok. Lunch doesn't include drinks not even mineral water which I found strange. Again, this is the best trip experience I have ever had in my life. I am thinking of repeating this in Jaipur! It was a very complete tour, amazing our driver Sharma was very kind! Our guide was wonderful he gave us a great input about the Taj Mahal story. The car was comfortable and clean. I totally recommended this tour! Thank you !! En Agra nos esperaba Shakul de PCTI, con un español fluido, fue una agradable recepcion. En los lugares que visitamos fue nuestro Angel Guardian, evitaba las colas para los tickets de ingreso, nos mostraba las mejores locaciones para fotos, evitaba que se acercaran los vendedores ambulantes, muy numerosos en los sitios turísticos, seleccionaba las rutas de visita y mostraba previa a la visita lo mas importante de cada lugar. El almuerzo mas que suficiente a base a comida local. 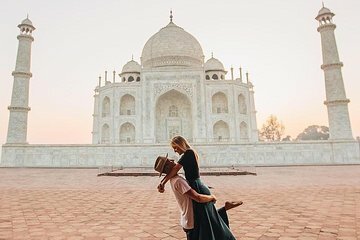 This was a great day tour to experience Agra and the delights of the Taj Mahal. Our driver who took us from Delhi to Agra was friendly and the car was very comfortable with wifi and water provided complimentary for the 3 and a half hour journey. Our tour guide who joined us once we arrived in Agra had lots of interesting facts about the Taj and the local area. The addition of the tour of the Agra Fort was great, we would not have thought to go there if it were not for this guided tour. It was my very first time in India... Despite the extreme fog and low visibility, this was a very lovely private tour. My guide Mahesh Kushwah and the chauffeur DK Sharma were extremely professional and accommodating. Due to the fog, we shifted the itinerary around, and visited the Red Fort, and Mehtab Bagh Gardens first, had lunch, and then visited the Taj Mahal which was a very great call as the fog subsided a bit. I had waited umpteenth years to visit Agra, and I wish the weather was better. Having said that, the guide has no control over the weather. Mahesh was not only a very knowledgeable guide, he was also an extremely great photographer. I was on my own on this trip, and having someone like him to help capture my memories on camera, from very priceless and hidden gem angles was a plus and blessing. At the end of the tour, the chauffeur DK drove me safely back to my hotel in New Delhi. I'll recommend them both anyway. Great job well done. Great tour. French Speaking guide Mody was excellent and his explanations in French were very clear and interesting.Very polite and careful driver Sharma. It is a full 4-hour drive from Gurgaon to Agra but our driver was right on time picking us up from the hotel and delivered us to our local guide as planned. Saurabh Gupta, our guide in Agra was very well versed in the history of the area and the Taj specifically. We had plenty of time to enjoy both the Taj Mahal and the Agra Fort and our guide provided pertinent explanations at convenient vantage points all along the way. Our express admission to the Taj bypassed thousands of waiting visitors and put us into the mausoleum quickly and easily. The Agra Fort is fascinating in its own right and is also well worth the visit! The provided restaurant lunch was in a very pleasant air conditioned restaurant serving a typical Indian buffet which provided a nice respite from the heat of the day. Overall, a great experience which I would highly recommend.